The Hitachi Interactive Panel T-17SXL is a compact 17-inch LCD that functions as an interactive whiteboard. When you connect it to a computer, you can control the computer's applications. It works in conjunction with the Hitachi Software suite of presentation and collaboration tools. It is ergonomic, pen-driven, and has SXGA resolution. The T-17SXL allows you to write digital notes on the display with the pen and deliver interactive presentations which the audience can view on a large screen when you have it connected to a projector. 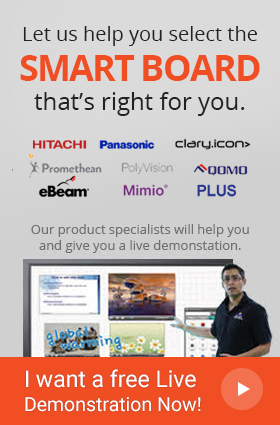 You can maximize creativity of your students with the StarBoard T-17SXL, and make your presentation more interactive. The T-17SXL has the full functionality of an interactive whiteboard. You can write digital notes on the display that your audience will be viewing projected on a large screen. You are in control of a powerful and productive multimedia environment. The T-17SXL allows you to interact with lessons, connect ideas, navigate through documents and websites, and write over any application, image or video. You can save and distribute your notes to the class, revisit the session later, and email a copy to you attendees. You can use the flexible interactive display to your benefit. It integrates seamlessly with your style of presentation with its attractive size and low-profile design. You can place it conveniently on a desktop or lectern to provide more working space for you. Its clear image with SXGA resolution works well with high-resolution LCD projectors.